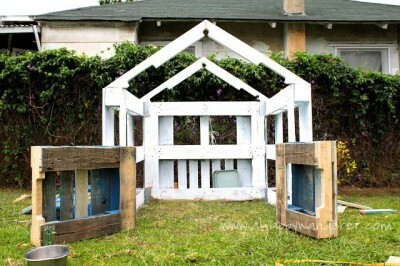 A kids house to play made with pallets? Why not?! It’s an idea that we can find at ahappywanderer.com and here I’m going to explain you how to do it. 4 wooden pallets to make 3 walls and a door, and a fifth pallet where we’ll take the beams that are going to build the roof, is all you need to get started. Then little by little we will be adding new details that we might need… First following the first picture I just have to join 3 pallets to begin setting up the house. If you want we can also cut some holes in the pallets to add windows. From a fifth pallet we’ll extract the beams that are going to build the roof structure, we just have to create two triangles. We can also start painting the house or leave it for the end. The door is another pallet cut for the occasion and set to the house structure using 2 hinges per gate. You don’t need to build a floor if we place it over the grass. I specially love the choice of the white color, and then to give to the house a touch of color we have painted yellow the exterior tables. To make the roof simply use a white sheet cut with the right dimensions, like a camping tent, we tighten and tie it to the frame structure using ribbons, we just have to sew them to the sheet. Do you like this DIY pallet kids house? Do you want to look for more DIY pallet houses?